Stacks of old newspapers are a major fire hazard. Recycle them ASAP. Very old ones (say, pre-World War II) might be of interest to a historic house museum of that same era or to a historical society from that region. If so, you can donate them–it is unlikely they would be willing or able to pay for them. 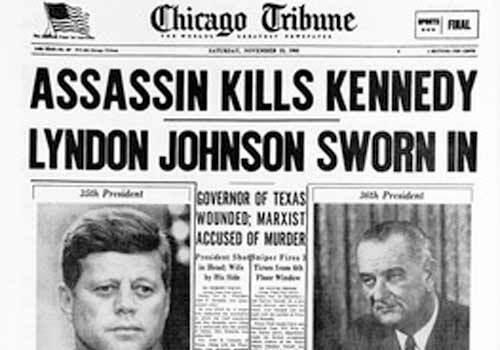 Many people saved front pages with important headlines—Titanic Sinks After Collision with Iceberg or Princess Diana Killed in Crash—thinking that they will be worth something someday. They were wrong. There are simply too many of these around for them to have any value. You might get a few dollars for them at an antiques show from a dealer who sells paper items like postcards, prints, posters, old newspapers, and advertising. Consider donating them to a high school history teacher to use in class. Have you found some old signs (wooden, tin or porcelain enamel) in the attic or among the Stuff you’ve inherited? What about other forms of advertising? 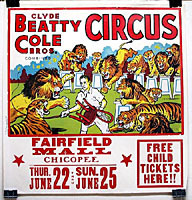 Posters promoting movies, travel destinations, theater shows, vaudeville, circuses, liquor, and the like; product packaging (tins, boxes, bottles, medicine); and trays? There are many other types of advertising, such as matchbooks, calendars, or magazine ads, but they seldom have much value unless very old. Certain themes bring the most interest and, therefore, the most money, such as beer, liquor, soft drinks (especially Coke), gas stations, military (like “Loose Lips Sink Ships” or recruiting posters), automobiles, trains, and tobacco. Some people call advertising “poor man’s art.” Although advertising has existed since ancient days, the collectors most likely to buy your advertising Stuff are collecting things from the late 1800s to the 1950s. As always, start by identifying your Stuff. Go to www.eBay.com and see if there is anything like your item offered for sale. Check the box marked Completed Listings, and see what price those items brought. Remember, half the Stuff on eBay never sells, so you can’t tell much by seller’s asking price alone. Look in your library for one of the advertising collector’s guides. General ones like Warman’s Advertising and targeted ones like the Encyclopedia of Porcelain Enamel Advertising can be ordered from another library by your librarian; used copies are available cheap on www.amazon.com. These guides will help you identify and describe what you have. Check the guide’s publication date. If it is only a couple years old, the buyer’s price they assign may be roughly accurate after you halve it to get an approximate seller’s price. If the book is older than a few years, just use it to help identify your object and then go online for more up-to-date valuations. If the dollar amount looks to be more than a hundred dollars, give or take, check some of the regional auction houses across the country to see if they might be interested in selling the item for you. Contact them online and send a picture of all sides of your Stuff, its measurements, and anything else you know about it. Want to ruin the sales value of the old Stuff you’ve inherited? Of course you don’t. Read on . . .
Do not polish, paint, or touch up old Stuff you plan to sell. If something is filthy, wipe it with a damp cloth, but resist the temptation to use any chemicals or cleaning solutions on it. The value of many an antique or collectible has dropped significantly when misguided owners tried to “improve” its looks. Another consideration: tastes change. When my mother-in-law had an antique desk stripped and “antiqued” white (a popular finish in the 70s that involved applying a layer of stain over paint and wiping it off before it was dry), thereby ruining its value forever. Worse yet, the streaky look was “out” within a few years. Do not touch up the paint on furniture or art work. 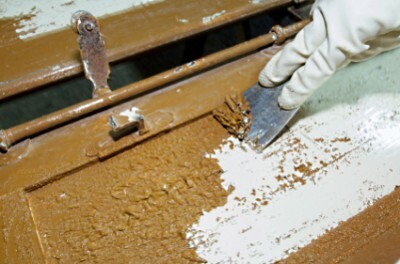 Do not strip painted furniture, even if the paint is peeling or uneven or an ugly color. Do not refinish old wooden furniture. If you are certain it is worthless or you plan to keep it, feel free to paint or refinish to your heart’s content. 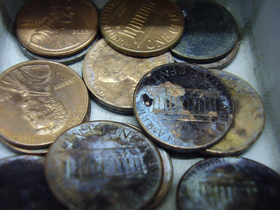 Do not “beautify” old coins by using a coin dip or ultrasonic treatment. Do not wash vintage clothing or quilts or linens in the washing machine with hot water or bleach. Too rough, too hot, too harsh. I know whereof I speak: I once washed a dirty old quilt in the washing machine in hot water and bleach . . . it came out like wet kleenex. Polish old silver with a mild silver polish and wash with soap and warm water. Never use those harsh dips you see advertised on TV that show the happy homemaker dipping her blackened silver into the solution and smiling as it comes out sparkly. Do not wash old glass or crystal in the dishwasher. Wash by hand in the sink in hot sudsy water.